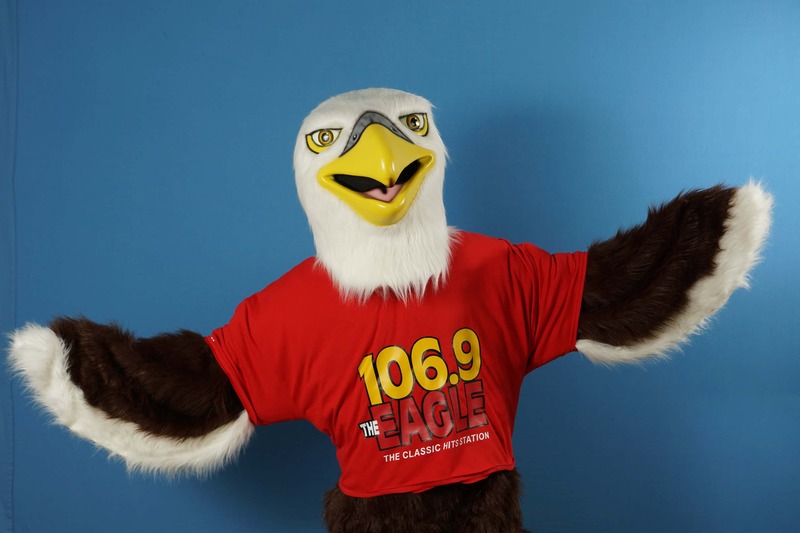 Thanks for listening to 106.9 The Eagle! I love meeting all our loyal Eagle listeners when we’re around town. I hope I’ll have a chance to meet you soon too! I grew up in a great big comfortable nest on the top of a majestic looking tree right next door to the 106.9 The Eagle studios. I love Rock n’ Roll! My favorite artists are The Eagles, the Black Crowes and the Byrds! No, my favorite NFL team is not the Philadelphia Eagles….it’s actually the Washington Redskins! I’m also buddies with Edgar, Allan and Poe from the Baltimore Ravens, Slapshot from the Washington Capitals and Keyote from the Frederick Keys! Some of my friends have their very own webcam in Shepherdstown, West Virginia. Go check ’em out by clicking the link! Why are they called Bald Eagles? Bald Eagles are not bald at all, but have a white head. Hundreds of years ago the English word for WHITE was BALDE and the word piebalde meant mottled with white, so the eagles with white heads were called Balde Eagles. They are very good swimmers. Sometimes an eagle will catch a fish in its talons that is too heavy for them to carry and they will swim to shore with it so they can eat it. Bald Eagles kept in captivity may live 40 years or more. Although we don’t know for sure, we think that in the wild Bald Eagles may live to be 30 or a little older. Bald Eagles are primarily scavengers. Whenever possible they find and eat dead food like spawned-out salmon or road-killed animals. Their favourite food is fish, but they will eat small mammals like rabbits and water birds like ducks or gulls. Here are some of the friends I’ve met in 2013! Click HERE to go to the Eddie Van Eagle Photo Gallery!